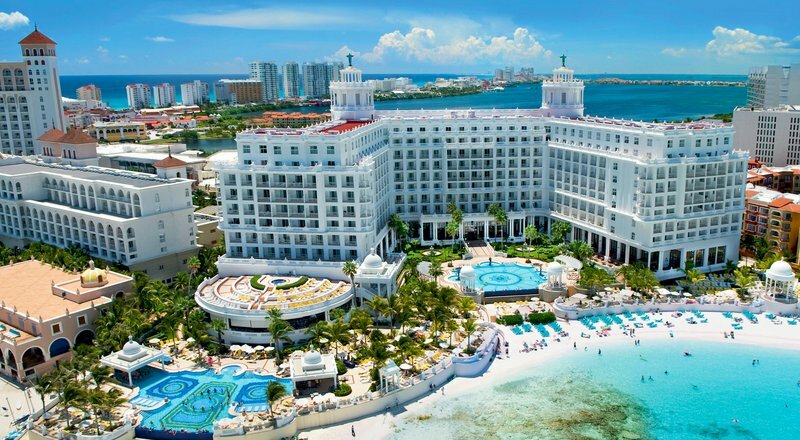 The Hotel Riu Palace Las Americas (All Inclusive 24h) is perfect for enjoying your vacation in the city of Cancun, Mexico. The hotel has a beautiful beach that can be seen from the extravagant lobby that has columns rising to hand painted domes in floral designs and gold leaf to a stained glass ceiling. Riu Palace hotels, guests will enjoy high quality service with excellent facilities such as two fresh water swimming pools, one that has a swim up bar, Jacuzzi, gym, sauna and the “Renova Spa” wellness centerthat has a range of different treatments and massages. The kids ages 4-12 will also enjoy the RiuLand Mini-Club. Traveling as a family, couple or with a group you can all enjoy the daily activities like table tennis, volleyball, snorkeling and much more. In the evening you are invited to watch the various shows, listen to live music and go dancing in the Pacha club or go for a night on the town to various clubs. The Palace Las Americas has 372 rooms with junior suites are all split level with a sitting area. Each suite has a safe, mini-bar, liquor dispenser and free Wi-Fi. The hotel does have five bars with one that has a swim up bar, 24 hour roomservice and 6 restaurants, the main buffet which also has a themed dinner three times a week, optional dining (à la carte, reservations required in advance):”Los Arcos” Italian restaurant, “Sakura” Japanese restaurant, Grill and steakhouse, “Tío Pepe” Mexican restaurant, Krystal” Fusion restaurant.